“People who might need disability support also live full lives,” says Rev. Vicki Terrell (left), seen here with Michelle Smith, her Individualised Funding coach. 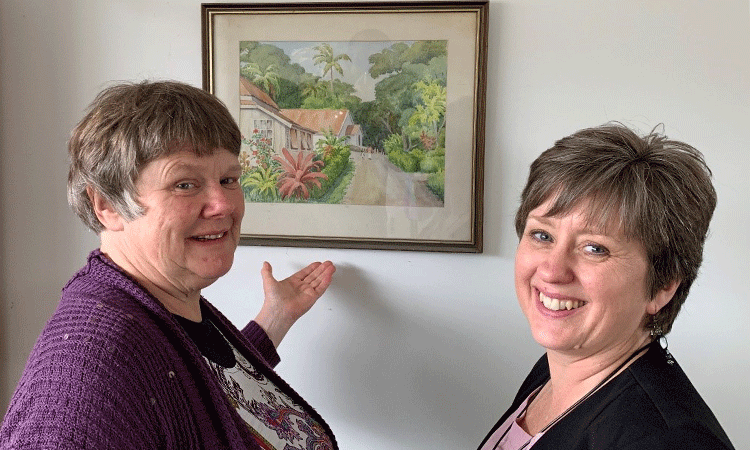 In this picture, Vicki and Michelle are talking about the scene of village life in the islands in the 1960s, painted by Ruth Burgess, Vicki’s grandmother. To someone who didn’t know better, Rev. Vicki Terrell can seem like a good advocate and champion for people with disabilities. She lives independently, supports her elderly mum, and is currently a Board-appointed regional representative for CCS Disability Action. Vicki has also helped to set up the Disability, Spirituality and Faith Network Aotearoa New Zealand (DSF), who published the book ‘Creating Welcoming Churches’. However, it is these assumptions that frustrate her the most. “People don’t stop to listen to my point of view,” says Vicki. Some people assume she has an intellectual impairment, she doesn’t. Vicki has a speech and fine motor skills impairment. In November 2009, Vicki became an ordained Anglican Priest. She is a Disability Community Chaplain within the Anglican Diocese in Auckland. Her impairment leaves Vicki quite tired and most household tasks take more time and energy than the average person. She tried accessing a few support service agencies but she felt the restrictions were not helpful. “I was grateful for the support with household tasks but felt the process was disabling rather enabling me to live well,” says Vicki, who decided to try Lifewise after a friend’s recommendation. Now, three months later, she is very pleased with Michelle Smith, her IF coach. “She treated me as a real person,” says Vicki. Lifewise is a host provider for people with Individualised Funding (IF). If you’re living with a disability and have IF from the Ministry of Health, we can work with you to establish the individually tailored support you require, including a choice of support worker as well as days and times suitable to your lifestyle. If you want to know more about IF, Michelle would be happy to chat with you and answer any questions you have. Thanks to Lifewise’s support, Vicki has more time and energy to follow her passions such as her priestly vocation, advocacy and advice, strategic thinking, and helping to organise conferences, like the one the DSF Network are planning for the year 2020. “Our support services need to empower people to live life to the full and enable people to make a contribution to society,” says Vicki. For instance, now with IF, Vicki can contract someone who will clean a room just like she would, including wiping the skirting boards and removing cobwebs. “People who might need disability support also live full lives,” says Vicki. It’s up to service providers to offer support that can help them achieve this. On December 3, Lifewise is observing International Day of Persons with Disabilities, supporting the 2018 theme of “Empowering persons with disabilities and ensuring inclusiveness and equality”.